It appears that LSRPs must consider, and responsible parties must remediate, PFOAs and likely the other two PFASs listed on the new webpage: Perfluorononanoic Acid (PFNA); and Perfluorooctanesulfonic Acid (PFOS), but the proposed drinking water standards for these PFASs are in parts per trillion, and it’s unclear how these standards would, for example, translate into soil remediation standards. It’s both unclear what constitutes a contaminant of emerging concern for site remediation purposes, and the extent to which any such contaminant must be remediated. This emerging issue will need to be watched closely. 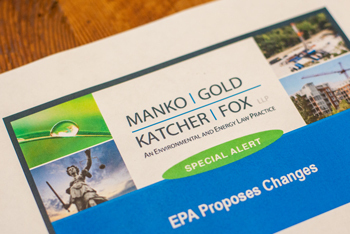 For more information or questions on contaminants of emerging concerns, contact MGKF attorneys John Gullace or Bruce Katcher or Technical Consultant Darryl Borrelli at 484-430-5700.